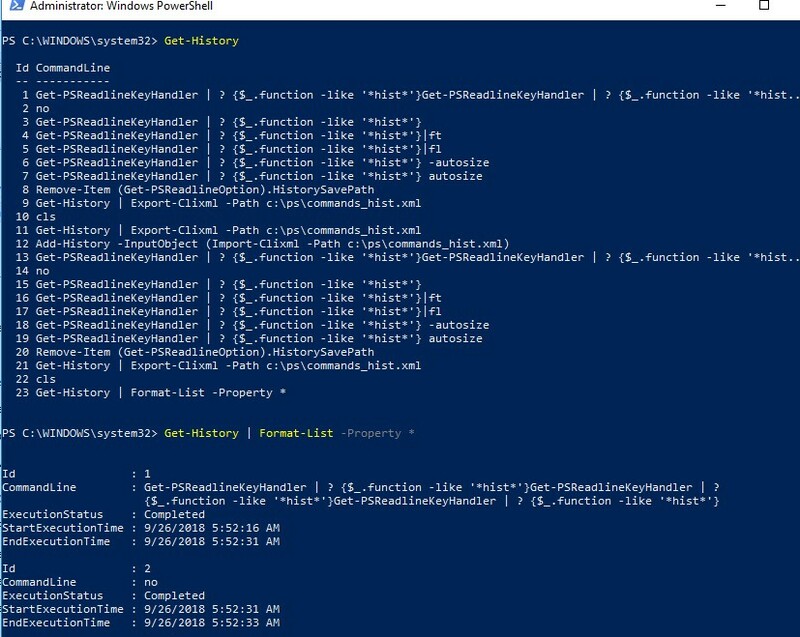 Windows PowerShell (as well as the Command prompt) saves the history of executed commands only in the current PowerShell session. When the PowerShell console window is closed or the computer restarts, the history of the PowerShell commands that you typed is not being saved anywhere. Compared with the bash, this is a significant drawback. In the PowerShell v5 introduced in Windows 10, this drawback was fixed. Suppose you typed and executed some complicated PowerShell command. In Windows 10 and Windows Server 2016, even after restart the computer, you can open a new PowerShell session and press the up arrow key. The last command you entered should be displayed on the screen. If you continue to press the “up” key, you will see all the commands executed earlier. Thus, using the keys “up” and “down” you can scroll through the history of PoSh commands and re-execute previously typed commands. In earlier versions of PowerShell, the history of the commands in the current session is not being saved after it is closed. Using the up/down keys, you can scroll through the history of the current session commands or list them using the Get-History cmdlet. By default, the PowerShell in Windows 10 saves the last 4096 commands that are stored in a plain text file located in the profile of each user %userprofile%\AppData\Roaming\Microsoft\Windows\PowerShell\PSReadline\ConsoleHost_history.txt. The history is stored separately for PowerShell and ISE. The running of PowerShell command saves a log to the history when it finishes executing. If the PoSh command takes a long time to execute, you will see it in the command history only when it completes. If you do not want to browse the entire history of PowerShell commands using up / down arrows, you can search the command history using CTRL+R (reverse search) or CTRL+S (forward search). Press the key combination and start typing part of the command that you want to find in previously executed commands. The text you entered will be found in the command history in any position (unlike search in PowerShell using F8 or Shift+F8, which allows to look for the matches from the beginning of the line only) and a suitable variant will be highlighted. Note. 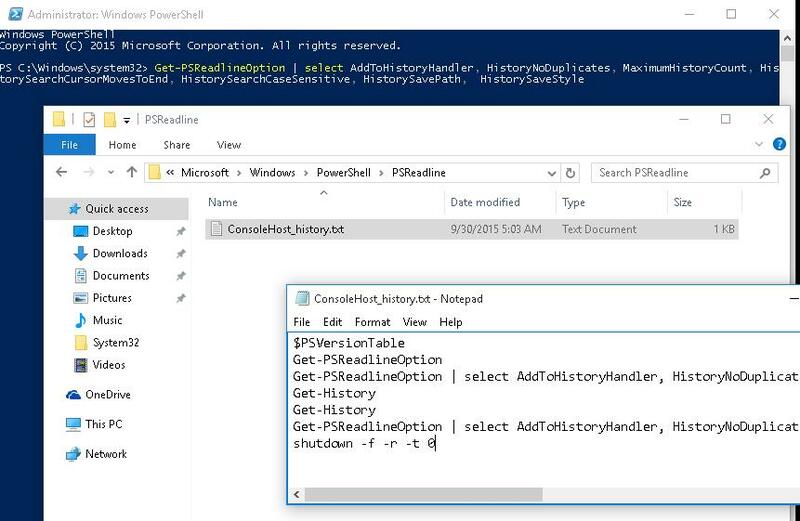 The command history function in PowerShell 5 is not built into the Windows Management Framework itself, but is based on the third-party PSReadLine module, which significantly extends the functionality of the PowerShell console. PSReadLine highlights the syntax in the console, it is responsible for selection of the text with your mouse and copying/pasting it using CTRL+C and CTRL+V. This module in Windows 10 is located in the folder C:\Program Files\WindowsPowerShell\Modules\PSReadline and is automatically imported when the PowerShell console starts. Unbound ViSearchHistoryBackward Starts a new seach backward in the history. SaveNothing — disable saving command history. So, the ability to save the history of PowerShell commands is one of the arguments to prefer PoSh 5.0 to cmd. As we explained above, the PSReadline module saves all the PowerShell console commands to a text file. However, in some cases, the administrator has to enter various confidential information in the PowerShell console (credentials, passwords, addresses, personal data, etc.). 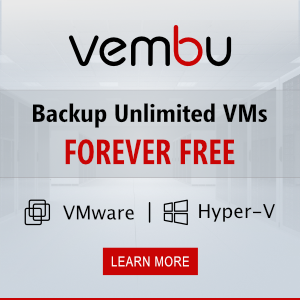 Thus, another server administrator or attacker can access the history data in a plain text file. For security reasons, you might need to clear the history of the executed PowerShell commands or completely disable the command history. The Clear-History cmdlet can not be used to clear the history of commands. It clears only the list of previous commands that the Get-History cmdlet displays. After that, close the PoSh window. Sometimes it is convenient to have the same set of frequently used PowerShell commands on different computers. You can export the current command history on your computer to an xml file and import it to other computers. Also this can be done by copying the ConsoleHost_history.txt file to user profiles on the desired computers. So, is this a PowerShell 5 feature, or a Windows 10 feature? I’m asking because I installed WMF 5 on Windows 7 (KB3134760), and even though it’s now been upgraded to PowerShell 5 (confirmed by $PSVersionTable.psversion), I’m still finding no trace of the history file. Additionally, you need to install PSReadLine module (ncluded in Windows 10).